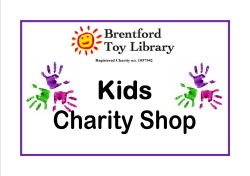 Brentford Toy Library opened their Charity Shop which went so well they are looking for donations of children's items. If you're having a clear out before Christmas this is the perfect opportunity. Children's items in good used condition are needed. In particular: Books, Clothing (aged 0-10yrs), Toys, Games, Puzzles, Nursery Equipment, Shoes, Baby items such as activity stations, pushchairs and bouncy chairs. Please think about the condition of the items you are donating; if you wouldn't want your kids to wear or play with it then nobody will probably want to buy it! Take your items to:Any Toy Library play session or direct to the Charity Shop on Fridays 12-4pm at the Docking Station on Brentford High Street. All donated items will be inspected before we sell them. Damaged or soiled goods cannot be sold. Unsuitable items shall be disposed of them accordingly. All items suitable for sale will be sold either in the charity shop or via ebay charity shop online. Items are sold at affordable prices. ALL money raised will be used to support Brentford Toy Library to run 4 free play sessions per week and will also support Brentford Toy Library to organise free community events and holiday outings.